Gil Shklarski has spent his career solving incredibly complex problems. Whether it was making Facebook safer or working on infrastructure for Microsoft’s maps, he’s always approached his work with a mathematician’s ability to break enormous missions into problem sets to be solved. Five years ago, he joined Flatiron Health as head of technology, and was tasked with building the oncology industry's first cloud-based software platform to manage clinical care and learn from the experience of every patient. Sounds like a big enough challenge — but scaling the technical team to do it quickly proved to be a massive undertaking on its own. It wasn’t immediately clear how he’d turn things around. But Shklarski, now CTO, had been using a framework, introduced to him by his executive coach Marcy Swenson, that had helped him navigate his own hairy decisions. He realized how helpful that same tool would be if it were applied team-wide. In this exclusive piece — based on a talk he gave at First Round’s CTO Unconference — Shklarski walks through the matrix he adapted to enable his increasingly autonomous and fragmented team to keep moving fast and smart through tough choices. Even if this isn’t happening quite yet, it’s a fork in the road every growing company will one day arrive at — hopefully prepared for what’s next. In this context, being prepared means making everyone on board feel empowered to make smart, strong decisions for the company. It’s a rare startup that actually anticipates and manages this transition in advance. Shklarski realized it was happening at Flatiron when the role of technical lead started to become unattractive. People were uncomfortable facilitating decision making; they didn't want to negotiate with their colleagues. Instead of stepping in to resolve individual issues as CTO, he decided to solve for his team's reluctance to make quick decisions in the first place. Psychological safety is a combination of empathy, time management and good conversational turn-taking. This blend makes people feel heard and appreciated. When a team expands quickly, psychological safety can be an early casualty. A bunch of new, rookie managers get anointed to handle a continuous stream of problems. Some of the problems are new, some are old. Many get revisited, because serving five customers is radically different than serving 100. 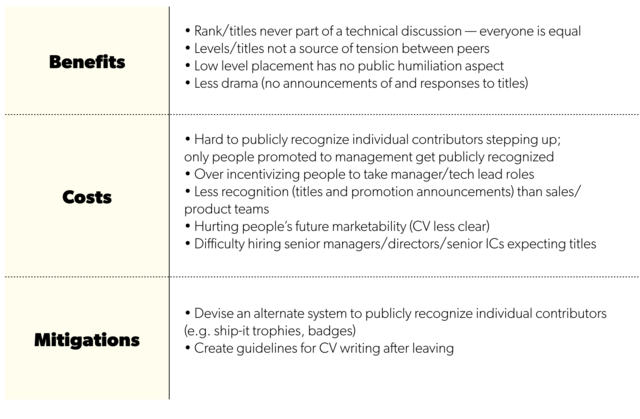 For managers, it can feel like there’s no time to consult others or incorporate feedback. They either end up making a bunch of judgment calls themselves or relying on slow, uneasy team consensus. At Flatiron, this resulted in a lot of crippling, culture-threatening stress. Shklarski saw the framework from his coach as a tool for his team leads to quickly and efficiently create alignment around decision-making — and at the same time, foster a level of psychological safety that would take fear, self-consciousness and anxiety out of the process. “Applying it to my own decisions helped me see things from others’ perspectives, removed my biases about how other people would judge my actions, and helped me stay motivated by what was right rather than what others or my boss would think," he says. "I wanted leaders on my team have this tool at their disposal." It's important to understand the distinction between good decision-making and good decisions. You can make a good decision that will still create chaos throughout your team if people aren't happy with how it was made. This framework is about improving team alignment while reducing stress in the decision-making process. This can be a quick, structured thought process for someone making a decision alone. But if a team is working together through a suggestion, Shklarski suggests writing it on a whiteboard or in a Google Doc that everyone can see. He prefers Google Docs because it’s more collaborative — rather than putting the onus on someone to write or interpret what others mean. The facilitator also needs to ensure no one is dominating the conversations and everyone gets to document their perceived benefits and concerns. This contributes to psychological safety by fostering conversational turn-taking. 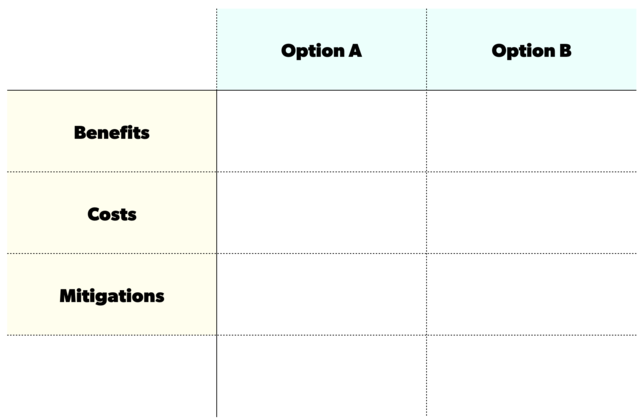 Filling in the Cost and Benefit slots for each choice should be pretty straightforward. Notably, the Cost row should also emphasize the risks associated with each choice. Having mitigation conversations elicits opinions and feedback from a wider range of people, and prompts the group to see the situation from other points of view — including those of other departments within the company that might touch or be affected by the decision at hand. It also gets everyone collaborating on possible solutions to the negative impacts on others. The exercise allows everyone on the team to put their fears, hopes and social anxieties into the decision-making process, and see them taken seriously as important factors. Sometimes through the conversation you end up adding a Column C or D because new options or ideas emerge with different or fewer risks. This exercise helped those involved see the tradeoffs and imagine what each scenario would look like after the decision was made. People's emotions and social ramifications were emphasized. “When I make decisions this way, I always say, ‘Okay, this is where we ended up. Here is your ‘24 hour freakout window, during which we can revisit the decision,'" Shklarski says. "Unless someone says something different in the next 24 hours, we’ll go with it." As he points out, the charts generated during decision-making meetings can and should be stored to refer to later — by new employees understanding the evolution of things, by teams revisiting old decisions, by people proposing something new after some time has gone by, etc. Flatiron had to decide whether to refactor a piece of billing software used by only a small subset of its users — the other option was to rebuild a similar product from scratch. The existing software component was part of a big .NET monolith it had inherited through the acquisition of another company, and for a while wasn’t getting any love aside from bug fixes. Shklarski wasn’t involved — he heard about the matrix being used by a tech lead to untangle this choice secondhand. That’s how commonplace it had become. Again, the mitigations row was the secret sauce. It provided a place for all opinions to be documented. It served as a forcing function for people to hear, understand, and empathize with others’ points of view and proposed tradeoffs. And it made the task of aligning everyone an organic process. In the end, Flatiron decided to refactor and improve the software in place. 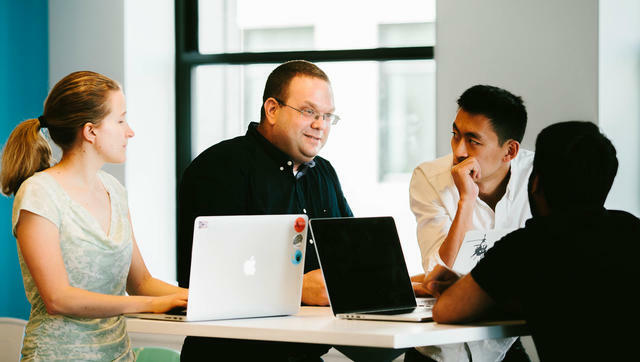 Shklarski (center) meeting with members of his team at Flatiron HQ. Decide how to split responsibilities between three adjacent teams. Make tradeoffs around prioritizing a team’s quarterly plan. Decide whether to build or buy a certain clinical content layer for their SaaS offering. Decide between options for an identity management system. Decide how to use headcount budget for one of their infrastructure teams. Decide whether to self-host a third-party software or use its cloud version. 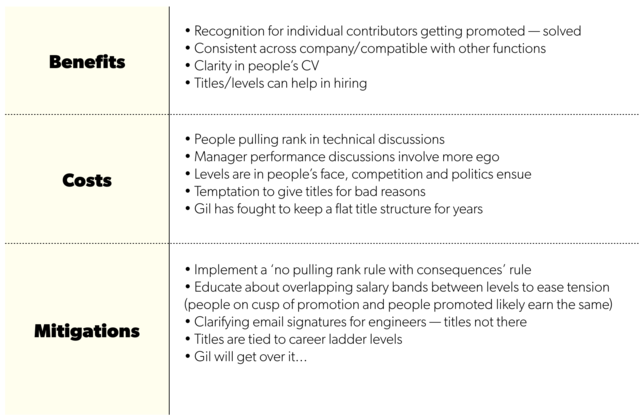 Decide on a hiring committee structure for executives. Have leaders within teams endorse the framework as a great way to make decisions. Have them lead by example by describing how they’ve applied it to make critical choices for themselves. It won’t become a hallmark of your team unless the leadership makes it ubiquitous. If you want to persuade a senior person to use the framework on their team, advise them to use it in their personal work first. They'll likely see a compelling difference. Bring the leaders at your company together for a detailed walkthrough of how to use the framework. At Flatiron, it's taught as part of a full-day offsite training, both allowing immersion and signaling its importance. It doesn’t have to be long — even just one hour will do. The key is showing a lot of examples of the matrix working in practice. Try to diversify the types of problems it’s being used to solve. If you can demonstrate it having utility for not just technical challenges, but also for marketing, design, finance, fundraising, etc., it’s much more likely to become embedded at your company. This also gives you the opportunity to tell managers to apply it on their teams. If it’s used at every tier, from single scrum teams on up to whole departments, everyone will depend on it more consistently. Expand its scope outside of tech. One of the biggest advantages of this system is that it’s not only useful for making technical decisions. It’s helpful for understanding the emotional ramifications of a type of behavior, or sussing out the right direction of a conversation. It’s a tool to not just align teammates, but to also to improve relationships. Describe the framework to your team as being more than a tool. It can be a reflection of your company’s values — values for making everyone feel heard, for empathy, for transparency, for clear communication. This will make it a much bigger deal than something to simply experiment with before moving on. It’s important to remember that this tool works best when participants have shared context. You need to be able to communicate the tradeoffs in a simplistic, mutually understood way. When there's no shared context, it's time to introduce organizational tools like a “responsibility assignment matrix” (i.e. RACI) to facilitate alignment when gathering information and making decisions. Today, Flatiron has 450 employees and its tools are integrated into 265 clinic across the country. The volume and velocity of decisions are as intense as ever, but the culture around those decisions is much healthier — largely because the matrix has become the default for creating alignment while making everyone feel heard. 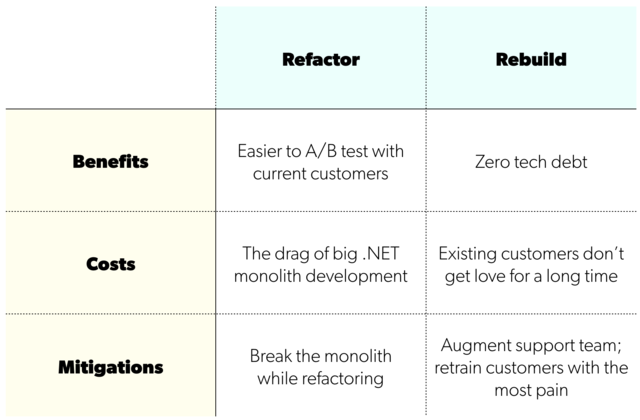 It’s been applied now so many times — in situations beyond Shklarski’s initial imagination — that it’s become a cornerstone of Flatiron’s engineering culture: One small chart, useful no matter how big the company gets. Photo by David Malan/DigitalVision/Getty Images.